August 30, 2017 — Researchers at the Hebrew University of Jerusalem have created a nanophotonic chip system using lasers and bacteria to observe fluorescence emitted from a single bacterial cell. To fix the bacteria in place and to route light toward individual bacterial cells, they used V-groove-shaped plasmonic waveguides, tiny aluminum-coated rods only tens of nanometers in diameter. 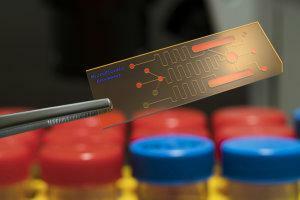 The novel system, described in the journal Nano Letters, paves the way for an efficient and portable on-chip system for diverse cell-based sensing applications, such as detecting chemicals in real-time. The research was led by Professor Uriel Levy, Director of The Harvey M. Krueger Family Center for Nanoscience and Nanotechnology at the Hebrew University in collaboration with Professor Shimshon Belkin, at the Hebrew University’s Alexander Silberman Institute of Life Sciences, who genetically engineered the bacterial sensors, and Professor Anders Kristensen from the Danish Technical University, who was in charge of fabricating the V-groove waveguides. Professor Levy is the Eric Samson Chair in Applied Science and Technology, and Professor Belkin is the Ministry of Labor and Social Welfare Chair in Industrial Hygiene, at the Hebrew University. The research is a collaboration between scientists at the Department of Applied Physics, the Rachel and Selim Benin School of Engineering and Computer Science, the Harvey M. Krueger Family Center for Nanoscience and Nanotechnology, and the Alexander Silberman Institute of Life Sciences, at the Hebrew University of Jerusalem, Israel; and the Department of Micro- and Nanotechnology, Technical University of Denmark, Kongens Lyngby, Denmark. Additional researchers include Oren Lotan, Jonathan Bar-David, Cameron L.C. Smith, and Sharon Yagur-Kroll. Support: The researchers acknowledge financial support from the Danish International Network Programme (grant no. 1370-00124B) with Israel. Work in the Belkin lab was partially supported by the Minerva Center for Bio-Hybrid Complex Systems and by the NATO Science for Peace and Security Programme project 985042.